Before the release of Warcraft III, Blizzard had released five games and expansion packs for three of them (Hellfire was not developed by Blizzard, so it doesn't count). Similarly, Blizzard has released five games and three expansion packs, all of which were critically acclaimed. Having such an excellent track record is a difficult thing to deal with, as increasingly persnickety game players will have higher and higher lofty expectations of what the next game will be. Also of note, as Blizzard's popularity has grown, the attitude toward its games has gotten an increasingly interesting dynamic. The hype behind the game builds steadily until its release, and then, once the game is released, reaction is somewhat tepid. Within a few short weeks, however, you'll hear nothing but praise for the game, as the fickle gamers have been satisfied with a new addiction. For that reason, gamers have been waiting with bated breath for the third entry in the Warcraft series, titled "Reign of Chaos". How did Blizzard fare? Will their fans be satisfied? Read on for more. Quick recap: In Warcraft: Orcs and Humans, the men of Azeroth had driven the Orcs back to the Dark Portal, but lacked the means to permanently seal the portal. With the countryside battered and burned, the men fled to the nation of Lordaeron, under the banner of King Terenas. The humans, allied with the dwarves and elves, fought viciously against the new legions of the orcs pouring from the dark portal, before learning the dark secret behind the swarms of the green-skinned ones; they were but driven by demonic warlocks behind the portal, and subject to their whims. As such, the orcs later fought for their own freedom from the control of the daemons, and began to discover their own identity as a nation. In Warcraft III: Reign of Chaos, the orcs have been given settlement lands within Lordaeron in an attempt to allow them to peacefully coexist with the other races. However, a new threat is coming to the lands, and Thrall, son of Durotan, is the first to see it coming, thanks to the aid of a mysterious prophetic mage. The mage instructs Thrall to assemble the Horde and head west, across the sea to the lost continent of Kalimdor. Meanwhile, an aging King Terenas sits upon the throne, while his prot�g�, Prince Arthas, carries justice through the land with the help of an old friend, Uther the Lightbringer. Arthas discovers word of a new plague spreading through the lands to the north, and upon investigating it, discovers a new source of evil, lead by necromancers, skeletal warriors, and the undead. Arthas' quest for vengeance goes unsettled, however, and the paladin finds himself embroiled in a quest to purge the armies of darkness from the land. To say any more would betray some of the plot elements within the game. Despite the underpinnings of the RTS field in general, Blizzard is noteworthy for its integration of plot and storyline within its strategy titles. This game is no exception by any means; Blizzard has gone out of its way to bring the storyline and the Warcraft mythos in general to the forefront. 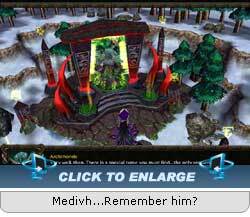 In Warcraft I and II, the drama unfolded between episodes during the mission briefs, but little changed throughout the course of the game. In Starcraft, Blizzard integrated more cutscenes, but did the majority of plot development through in-game character interactions and also during the mission briefings, which were no longer one-sided dialogues, but discussions, arguments, and all-out threats between the characters. 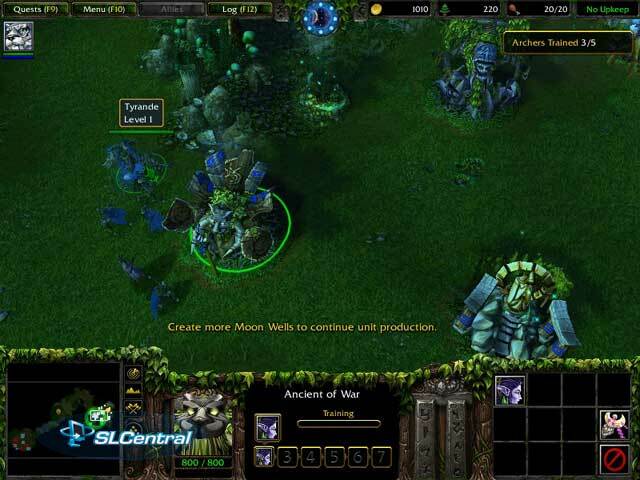 Now, Warcraft III brings more to the plate with in-game rendered cutscenes during which the plot will unfold. Since the cutscenes are displayed using the game's 3D engine, they can be scripted easily, and thus are smaller and more compact - This translates into more cutscenes, which allows for more plot development. 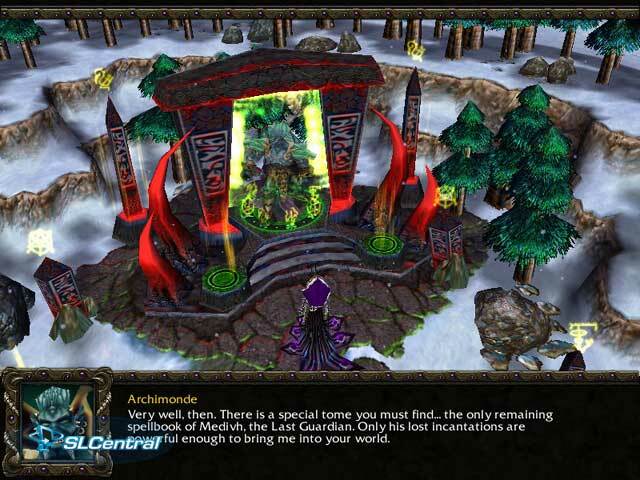 Blizzard uses this widely throughout Warcraft III - Each mission contains an average of about five or six cutscenes, as well as several interludes interspersed throughout each race's campaign. The game also uses Starcraft's in-game dialogue system - Characters will occasionally have discussions during a pivotal battle. While the majority of the dialogue was good, it seemed like the characters making chitchat during battles should sound a bit more�I don't know�involved in a battle?